In the recently released 2010 Zagat Fast Food Survey, which included 136 national restaurant chains, Atlanta Bread received Top 5 distinctions in two key categories. 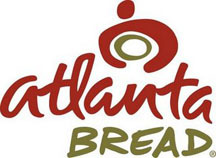 The survey's more than 6,500 participants voted Atlanta Bread among the Top 5 large chains (places with less than 5,000 locations) in the Healthy Options and Facilities categories. This is the second straight year that Atlanta Bread placed among the Top 5 chains in these two categories. "We are extremely honored that our guests have recognized Atlanta Bread in these two vital areas," says Jerry Couvaras, Atlanta Bread's CEO and president. "Over the past several years we have continued to evolve our menu, as well as our design and decor. The results of the exclusive Zagat Survey tell us that our customers are pleased with this enhanced experience and we look forward to continuing to provide our guests with globally inspired, locally sourced menu items in a comfortable, eclectic environment." The Zagat rankings follow other recent consumer-centric distinctions Atlanta Bread has received, including being named by Parents magazine as one of the "Top-Ten Fast-Casual Restaurants for Families" and one of the country's "Top-Ten Healthiest Fast Food Restaurants" by Health magazine.